My first election campaign spoiled me. I stopped at the Democratic headquarters in Davenport, Iowa in 1964, after paying the bill for my newspaper route, to stuff envelopes during Lyndon Johnson’s re-election campaign. Other campaign workers gave me a campaign button as a reward for helping out. Johnson won that year in a landslide which became a formative expectation about Democratic politics. However, with the 1968 Democratic national convention in Chicago, Hubert H. Humphrey’s loss, and the election of Richard Nixon my attitude changed. I didn’t understand what happened. Since then, Democrats have never had an easy go of it. 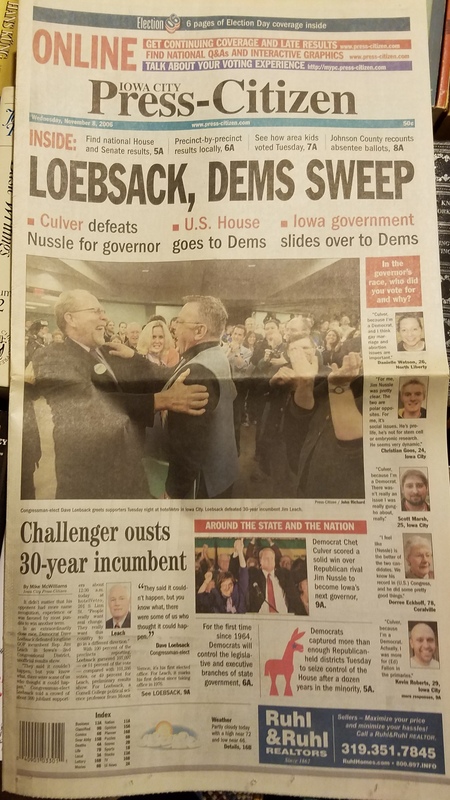 It wasn’t until the 2006 election of Dave Loebsack to the U.S. Congress that I experienced electoral jubilation similar to 1964. I’d gone home after the polls closed to watch the returns on the T.V. When it became clear Loebsack had a chance to win I drove to the county seat and joined in the celebration as 30-year incumbent Jim Leach conceded the election to Loebsack. That election didn’t just happen. My work to replace Leach began the previous election cycle and was regular and persistent. The same can be said of the many local Democrats who helped Loebsack win. Winning demanded a lot of hard work. There is talk of a Democratic wave in 2018 but I don’t know about that. Our politics seems broken. People have hardened against the 45th president — withdrawn from society. For some the egregious behavior of the president and his marauding troop of grifters has drawn them out to participate in campaigns. Many — I’d say most — want no part of it. People have not only hardened against Trump, but against politics in its many forms. Heaven knows there is plenty to do to live a life, much less raise a family in 2018 without politics. The political dynamics that gave us big wins in the past are irrevocably changed. I volunteer a few hours a week with a local campaign and will do more beginning in September. Individual actions, while remaining important, are not enough. I attended an event with State Senator Joe Bolkcom of Iowa City where he said we should band together with like-minded people if we want to impact policy. The idea goes against the grain of rugged individualism that characterizes many of our lives. As Hillary Clinton said during the 2016 campaign, “We are stronger together.” What holds true for elections and public policy has broader application. There haven’t been any landslides since Reagan and may not be again for a long time. With the rise of the internet, people are more connected than ever and this has served to harden us in silos the way intercontinental ballistic missiles were during the Cold War. There remains an untapped power in the electorate but no one has found the control room in the age of Trump. There’s no clear path to unleashing citizens to rein in the corruption. Just the hard work of building an electorate to vote for Democratic candidates. As my summer of writing for Blog for Iowa closes, I’m thinking not only of the coming general election, but what’s next. You can’t repeat the past, as Nick Carraway said in The Great Gatsby. The problem with our politics is there are too many Jay Gatsbys and Tom and Daisy Buchanans obscuring the view of our potential. To achieve a progressive future, we have to be able to understand what it looks like. For that we need to step outside politics in the age of Trump for a while. This entry was posted in 2018 Election Campaign and tagged 2018 Election Campaign, Iowa progressives. Bookmark the permalink.